What is so special about synthetic rubber conformal coatings? Why do many high reliability applications require synthetic rubber? Would synthetic rubber be a better fit for your application? Synthetic rubber copolymer provides higher operating temperature and exhibits superior mechanical properties compared to traditional materials. The products have been developed to withstand the demanding conditions in the most severe environments required in today’s applications. Commonly used conformal coatings are acrylic, polyurethane and silicone. 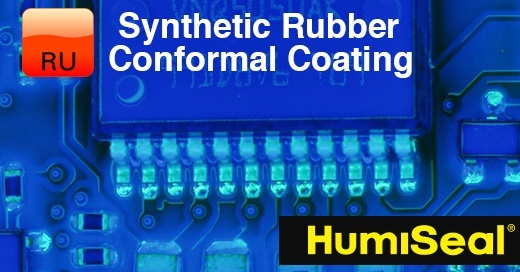 Less known are synthetic rubber conformal coatings, however these have been used for many years and HumiSeal continues to develop new and improved varieties of this chemistry. What are Synthetic Rubber Conformal Coatings and their Advantages? As the pitch density and packing density of electronics continues to miniaturize as a function of form factor and increased functionality, the requirements posed upon conformal coatings are changing. Increased operating temperature requirements along with an increase in long-term assembly reliability demands are becoming more prevalent. As a result, HumiSeal has introduced a range of synthetic rubber products that exhibit superior performance in these challenging conditions. These products have gained significant global qualifications especially in the automotive industry. Synthetic rubber copolymers contain specifically formulated blocked alkenes. These materials are extremely flexible and yielding under various temperatures, additionally they offer superior moisture protection. This translates to greater reliability testing performance as the material “flexes” and “recovers” under various stresses during thermal shock and thermal excursion testing. Furthermore, susceptibility to dendritic growth is minimized with the use of synthetic rubbers due to superior Moisture Vapor Permeability (MVP) resistance performance. The combination of water vapor and ionic contamination leads to dendritic growth. HumiSeal synthetic rubber conformal coatings provide the industry’s lowest moisture infiltration rate which is closely matched by HumiSeal UV curable coatings. Where most applications require a maximum constant operating temperature of 125°C, the solvent based acrylics and polyurethane technologies are well suited. The synthetic rubber constant operating temperature range varies greatly up to 150°C. These materials behave very well in a wide range of temperatures due to the unmatched thermo-mechanical properties. Synthetic rubber materials are solvent based and they can be applied using the same process equipment as used with existing acrylic/polyurethane. Therefore, the upgrade to a higher performance material can be done without the need to change process equipment and unlike UV curable conformal coatings, synthetic rubbers do not require capital investment in a UV oven, special handling requirements, lighting, etc. Synthetic rubbers meet the requirements of IPC-CC-830 as well as many automotive OEM standards. They are also UL 94 rated for flammability. Synthetic rubber materials are unique conformal coating products that enable users to achieve superior protection of electronic assemblies especially in high temperature and harsh environments. They exhibit excellent moisture protection, superior mechanical properties, higher continuous operating temperatures and improved no-clean compatibility compared to traditional type materials. Are you struggling to overcome high reliability requirements? Your answer may lay with synthetic rubber conformal coatings. Synthetic Rubber materials offer a much higher performance solution; they add value to printed circuit assembly reliability without the need to change the existing process equipment.